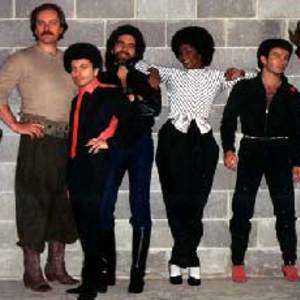 Lipps Inc. (pronounced like "lip sync") was a studio band that achieved one significant hit, "Funkytown" in 1980. The group was formed in Minneapolis by Steven Greenberg, who wrote and produced all of the group's music, and who also played several musical instruments. The lead singer and saxophonist was Cynthia Johnson, and the rest of the group consisted of a changing group of session musicians, including guitarist David Rivkin. The group was formed in Minneapolis by Steven Greenberg, who wrote and produced all of the group's music, and who also played several musical instruments. The lead singer and saxophonist was Cynthia Johnson, and the rest of the group consisted of a changing group of session musicians, including guitarist David Rivkin. They achieved some popularity during the late 1970s. The group released their debut album Mouth to Mouth in early 1979 (although original pressings of the album actually have 1979 or 1980 listed as the copyright date). Their hit from this album, "Funkytown" spent four weeks at Number one on both the Billboard Hot 100 and on the Hot Dance Music/Club Play charts in the United States and was awarded a platinum record. It reached number two in the United Kingdom and was a hit throughout the world. Their further singles failed to match their initial success (their only other Hot 100 entry was "Rock It", which peaked at #64), however they had more dance hits throughout the 1980s, including "How Long?" (originally a big hit for Ace) in 1981, which reached #4 on the U.S. dance chart. Lipps Inc. ceased in 1983 with the full-length album, 4 in 1983. Starring in 1984, Dobson Productions was a television label until 1993, settled between Lipps Inc. and The Fugees. Funkyworld - The Best Of Lipps Inc.